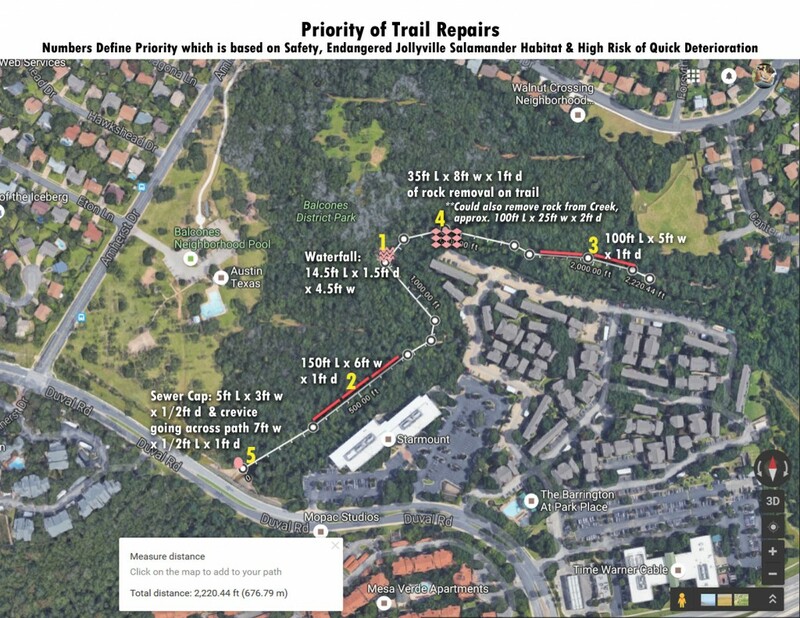 Creekside Trail in Balcones Park Closed for Construction as of Jan 31 | Milwood Neighborhood Assoc. Construction work is beginning today on the Creekside Trail on the west edge of Balcones Park from Duval overpass to baseball fields, so please plan your route accordingly. It should last approximately 2 months. An update on the grant fundraising as of 12/20/17, funds raised for the creekside trail repairs grant are now at $2,971, so we are only $6,332 away from what we need to provide our portion of the grant which will cover trail signage, maps, relandscaping of the pool and new trashcans. Want to donate? Look out for our Amplify Austin fundraising event coming up or click here to give today! Every penny you give will be more than doubled through the grant and given to our park improvements. We are also still in need of approx. 300 volunteer hours in the park so if you can join us for It’s My Park Day on Saturday, March 3rd from 10am to 1pm please do! We will post the registration soon!